It’s safe to say I’ve become a little obsessed with Trials Rising. I adhered to the “one more try” philosophy ever since I started playing, and it often resulted in some rather late nights. The thrill of speeding across every single track became a drug – a high I couldn’t do without, and it resulted in hours of trying to complete some of the tougher Contracts just to earn a few more points, or to shave a couple of seconds off a previous personal best. There’s something magical about Ubisoft RedLynx’s physics-based racer that I can’t get enough of, and after 10 minutes of mind-bending frustration, everything clicked into place. You’re constantly learning, whether it’s how to land correctly over a big drop, or reach a higher platform by simply using your body weight and speed in perfect harmony to do so. 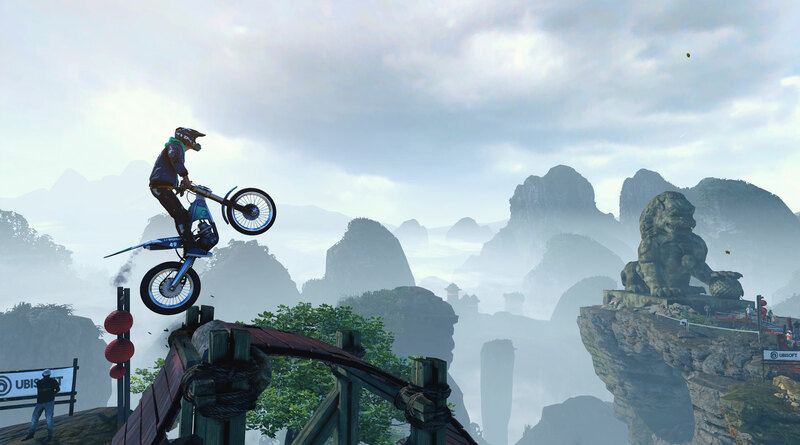 If you’ve never played a Trials game before, you’re eased in gently, with Beginner tracks filling up a lot of your time at the start. After your confidence is up, the difficulty goes from Easy, to Medium, to Hard, then to Extreme, and whilst this does feel impossible at times, you’ll complete a track that drove you mad only to be elated once you cross the finish line. Professor Fatshady at the University of Trials gives you plenty of guidance through different practices, such as throttle control, leaning, and rotation. As you level up, the lessons get harder, and when it gets to bunny hops you better hope that you’ve been paying attention. 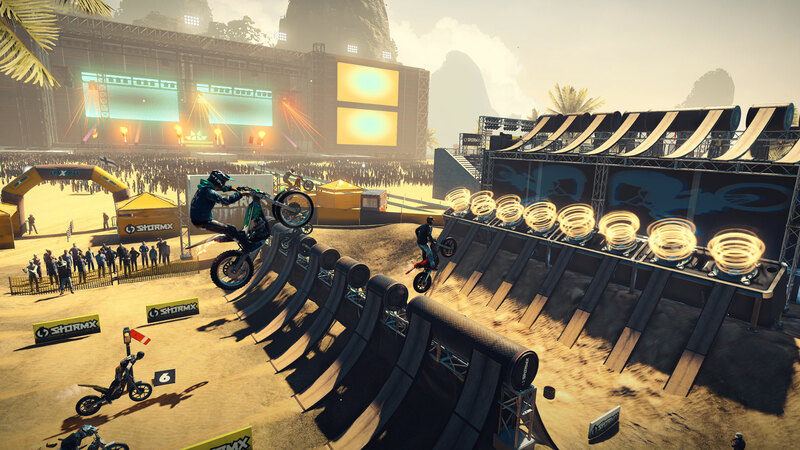 Trials Rising offers an excellent difficulty increase, and you never feel too overwhelmed; it is only when you hit level 40 that certain courses and Contracts take more than a couple of tries to complete. There’re a lot of different tracks scattered across the globe, ranging from simple races against others to completing them with only a limited number of fails. Other variables include skill challenges such as hitting a certain amount of front or back flips, and completing tracks under a specific time makes each new challenge inviting. As you progress, you’ll unlock different sponsors such as Fox, KTM, and RedLynx, and each one will give you items or other incentives to complete their challenges. Bas Van Mason at Fox tends to focus on more skill-based Contracts like doing a wheelie for 30m, or doing 10 back flips at some point during the course. Laia Russel at KTM tags on an extra race at the Stadium races and if you complete them you’ll earn a lot of XP for your troubles. Each of the six bikes handles very differently, creating a challenge within a challenge when tackling the same track. You start off with the Squid – a generic motorbike with balanced handling and speed. At a higher level you’ll unlock the Rhino which favours control and power over acceleration, and the Mantis which has wonderful movement, but lacks control. You can also spend money on a couple of bikes – the Helium and the Donkey – and in turn unlock new challenges specific to them. Finally, the Tandem is a bike both you and a friend control together, and it provides a lot of laughs as you try to use it. 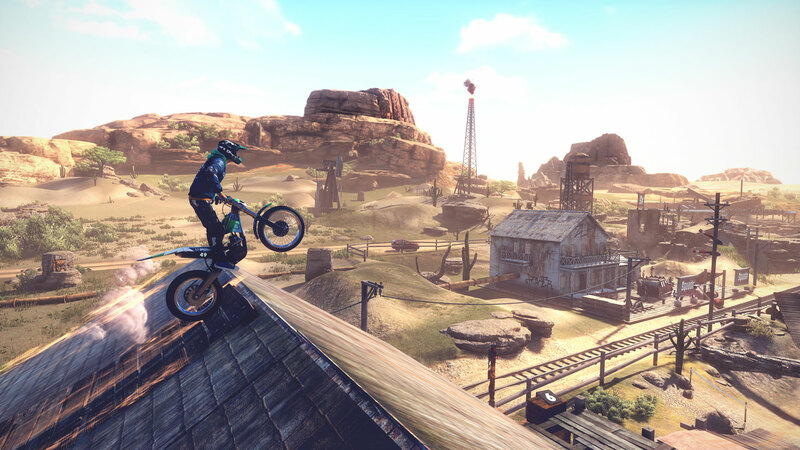 You can play through every track with the same bike, but Trials Rising lets you know the recommended bike for each course, and it pays to listen. The design of each track is sublime, and each one is totally different to the last. You’ll compete in Scotland, the USA, Cambodia, China, and Russia to name a few. All are visually stunning and push you to play with every trick and skill in your repertoire. Siberia Skies sees you race through a moving plane, bumping through a heavy wind and leading you over steep ramps and acute jumps, where MX and the City has plenty of high ramps and hamster wheels where speed is paramount. Ubisoft Kiev and RedLynx have designed a beautiful game, one where each environment looks fantastic. With some of the more ambitious tracks, I did notice quite a lot of framerate issues, and when it happens right before a big jump you have very little time to compose yourself, leading to unnecessary fails. Trials Rising contains a lot of customisation, which in theory can be great, but after opening your twentieth Gear Crate (which are earned as you level up) and getting the flamed shirt for the tenth time, or the same ripped denim jacket, the repetition becomes annoying. You can spend your in-game money to re-roll, but I found I was still getting the same items. For a game that promises tons of customisation, it seems to come from what you do with the items that makes them different, and not the actual piece of clothing or bike part. There are tons of stickers to unlock which you can use to write on clothing or bike parts, and there is a store where you can buy individual items, but they’re relatively expensive so not every item will be available to you. You do earn specific items from Pascal at Ubisoft and others, but after putting a lot of time in, I’m pretty disappointed with what’s on offer. Trials Rising is a thrilling and addictive ride, acting as a physics-based puzzler as much as a racing game, with tons of courses providing hours of replayability and enjoyment. The multiplayer elements weren’t really available at the time of play due to it not being released, but friend’s records pop up on screen to let you know if one of your times has been beaten, and global leaderboards give you the motivation to try and beat them. Some of the framerate drops meant I’d crash when going into a jump and it became rather frustrating after a few times of it happening. 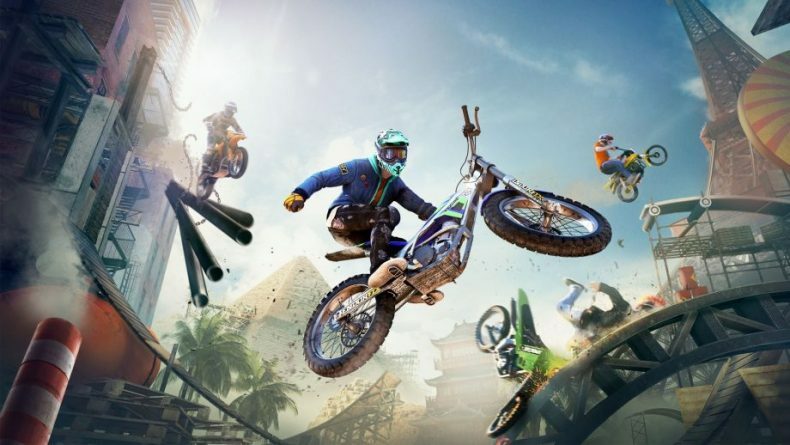 The customisation has some promise, but the majority of items feel a bit dull, and I’d hope at a later date we might get some other clothing from a range of Ubisoft titles to make the creation elements of Trials Rising a bit more exciting. Regardless, I still had plenty of fun ripping through the various courses at breakneck speed, using every ounce of control to make sure I landed as perfect as I could, and using the different skills I’d learned to earn every Contract I was offered.